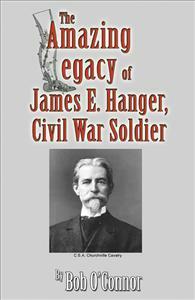 James E. Hanger was wounded at Philippi, Virginia on June 3, 1861 and became the first amputee of the American Civil War. He hated the Yankee peg leg his Union doctor gave him. Instead, he used his ingenuity and engineering background to invent an artificial leg with a joint at the knee and a hinge at the ankle. He patented his Hanger Limb. His invention revolutionized the prosthetic industry. The company Mr. Hanger founded still operates today as one of the world’s largest providers of artificial limbs. His story is quite remarkable. James E. Hanger was wounded at Philippi, Virginia on June 3, 1861 and became the first amputee of the American Civil War. He hated the Yankee peg leg his Union doctor gave him. Instead, he used his ingenuity and engineering background to invent an artificial leg with a joint at the knee and a hinge at the ankle. He patented his Hanger Limb. His invention revolutionized the prosthetic industry. The company Mr. Hanger founded still operates today as one of the world’s largest providers of artificial limbs. His story is quite remarkable.